Lacing up a black Chuck Taylor high top. There is nothing finer than lacing up a pair of high top Converse All Star Chuck Taylor shoes in the morning. Putting on chucks is always a great way to start the day, and that comfortable feeling will be with you until you take them off that night. Why the big deal about a pair of canvas sneakers? Anyone who likes to wear chucks knows that they are not just canvas sneakers! They have style, they have cachet, they mould to your feet like a glove, and they become part of your comfort zone. Why do you get that special feeling with chucks and not any of the other canvas sneakers you can buy these days? It starts with style. The design of the Chuck Taylor All Star is unique and eye catching. You have a pair on, or you see someone with a pair on and you are immediately a part of that cool style that everyone notices. So many other brands and models of sneakers are almost anonymous in the way that they look when you see them, you don’t even bother to take a second look. But with a pair of chucks on, you are always noticed, and people always take a second look. Yes, they are chucks. People are almost relieved that you are wearing the real thing. In fact so much so that you feel disappointed for someone who wears a look-alike shoe. You wonder, “What were they thinking?” to buy a pair of knockoffs, when for maybe a few more dollars and a little more effort to find the right color, model and size of a pair of Chuck Taylor shoes you could have the real thing. What are some of the distinctive qualities that people admire and approve of? When you lace up a pair of chucks you are wearing the shoes of great basketball players and athletes, of great musicians and rock stars, of celebrities and just plain folk, and of generations of Americans who have proudly worn them since Chuck Taylor first signed a pair back in 1932. That blue star ankle patch with Chuck Taylor’s signature, the red CONVERSE ALL STAR lettering, and the little “running mice” dashed lines all around the white circle is your cachet, your mark of authenticity, and your sign of distinction. If that wasn’t enough you also have the license plate heel patch with the star in between the words “ALL STAR”, the toe caps crisscrossed with diamond shapes, lines and dots, rubber racing stripes along the outer foxing, and the most distinctive footprint of any shoe in the world. And what other shoe has uppers that are literally a canvas to draw on with hundreds of colors and patterns made for it over the years? 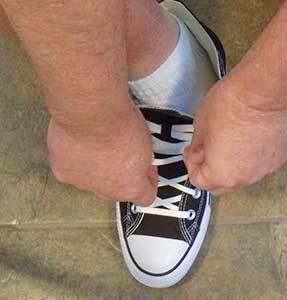 When you lace up a new pair of chucks (or any shoe) for the first time, the shoe and your feet start the process of “getting acquainted”. Your shoes will gradually adjust to your feet, through the process of regular wear. With chucks this process is greatly accelerated as they quickly mould to your feet. They quickly become comfortable, often by the end of the first day. Adjusting the laces just right is part of the process — you use more or less lace and all or some of the eyelets depending on the look you want and the activities you engage in. As you continue to wear them, the uppers absorb your sweat, the insole fits to your feet, and the outer sole get a little more flexible. Your chucks gradually become even lighter in feel, to a point where you hardly notice them. An important part of their comfort is their lightness. It may take a little bit of time to get used to if you have never worn them before, but once you do, you will never want to go back to heavier shoes. Wearing chucks is such a pleasure, I want to experience it every day! How do my chucks define my comfort zone? I have to say that any activity where I can be wearing my chucks defines that zone for me. I prefer the casual lifestyle and the casual dress that goes with it. For shirts, tees and polos do just fine. Maybe in the colder weather add a sweatshirt, sweater or a jacket. For pants, shorts in the summer and jeans the rest of the time. Maybe some khaki pants for a little dressier look. Finish off the ensemble with a pair of chucks, mostly black and white high tops for me, but its fun to get into the colors and seasonal chucks when I’m not at work for someone else. I’m fortunate that I can wear chucks at work most of the time. Once in a while a suit is required, but on those occasions usually the pressure is on, so those times aren’t exactly in my comfort zone. Of course I definitely wear my chucks all the rest of the time, they are an important part of my lifestyle. Like I said at the start of this article, there is nothing finer than lacing up a pair of high top chucks. It’s amazing to me how such a simple thing has brought so much pleasure throughout my life.